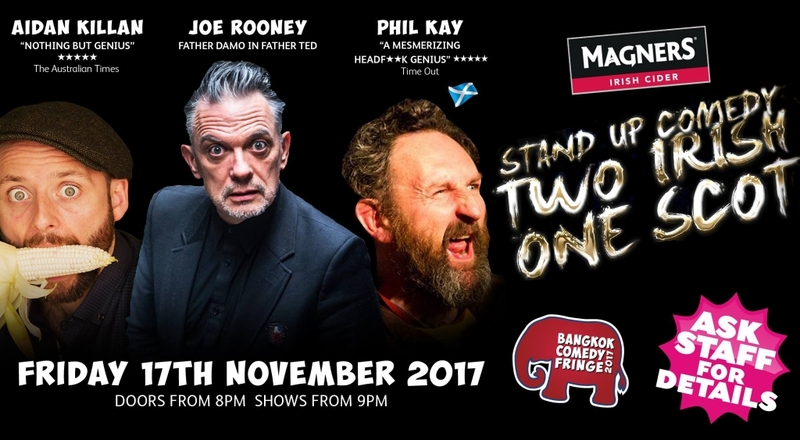 A World Class night of Comedy in Pattaya. Nov 17th. The Bangkok Comedy Festival comes to Pattaya for ONE NIGHT ONLY bringing their funniest comedians from Ireland, Scotland and England at The Havanna Bar (Holiday Inn). Hosted by Aidan Killian who is one of the most daring, original and thought-provoking comedians Ireland has ever produced, “Master class in satire” – Bunbury Magazine ☆☆☆☆☆. He has performed his unique, insightful comedy style for 7 Edinburgh Fringes and was a ‘highlight’ at Glastonbury Festival 2017 and was nominated for best comedian at The World Fringe. During his world comedy tour he was described as “Deliciously subversive” – The Advertiser (Australia) ☆☆☆☆ while in Edinburgh the critics compared him to Tommy Tiernan and Russell Brand, “Hysterical… Passionate driven intelligence” – Chortle ☆☆☆☆.